Background: Anesthesia is regarded as an integral part of cesarean section due to its elimination of pain and discomfort. Pregnant women need to have awareness of anesthesia for cesarean section. Objectives: The aim of this study was to determine the knowledge, attitude, and perception of pregnant women toward anesthesia for cesarean section. Materials and Methods: This was a cross-sectional study among consenting pregnant women at Aminu Kano Teaching Hospital. A structured pretested questionnaire was used to obtain information from the participants. Ethical approval was obtained from the hospital ethics committee. Data obtained was analyzed using SPSS version 18 (SPSS Inc., Chicago, Illinois, 2012, US). Fischer's exact test was used for categorical data and P ≤ 0.05 was considered statistically significant. Results: The mean age ± standard deviation was 28.71 ± 5.635 years. Two hundred and thirty-two (68.8%) had knowledge of anesthesia for surgical procedures, and in up to 221 (65.5%), the anesthesia known to them was for cesarean section. Main sources of knowledge were from the clinic (195, 44.5%) and previous experience/exposure (180, 41.1%). The main anesthetic side effects were headache (24, 64.9%) and delayed recovery (11, 29.7%). Regional anesthesia was preferred (246, 73.0%) over general anesthesia (91, 27.0%) because of safety (258, 44.3%), fear of death (240, 41.2%), and the desire for being awake during the procedure (85, 14.5%). Knowledge of anesthesia was statistically associated with the age groups of the respondents (P = 0.027) and their occupation (P = 0.003). Conclusion: The study revealed high knowledge and awareness of anesthesia for cesarean section among pregnant women and regional anesthesia was preferred over general anesthesia. Anesthesia is defined as “loss of sensation and of consciousness without loss of vital functions artificially produced by the administration of one or more agents that block the passage of pain impulses along nerve pathways for the brain.” It could be general or local. General anesthesia is the induction of a balanced state of unconsciousness accompanied by the absence of pain sensation and the paralysis of skeletal muscle over the entire body. It is used during major surgeries and other invasive procedures. In local anesthesia, anesthetic agents are injected in a specific part of the body to induce the absence of sensation. Both regional (spinal, epidural, or combined epidural and spinal anesthesia) and general anesthesia are acceptable for administration during cesarean section though with preference of regional over general anesthesia due to its ability to allow the mother to be awake and interact immediately with her baby. The international healthcare community has considered the ideal cesarean section rate to be between 10% and 15%. Despite these considerations, there is generally a rising trend of cesarean section rates over the past decade. A cesarean section rate of 9.4% was noted from the early 1970s and has been on the increase to about 34% in the year 2002. In modern obstetrics, anesthesia is regarded as an integral part of cesarean section due to its role in the total elimination of pain discomfort and provision of some degree of relaxation. Studies have been conducted among pregnant women to evaluate their knowledge, attitude, and perception toward cesarean section in various parts of the country. A study conducted by Aziken et al. in Benin, Southern Nigeria, among pregnant women, showed that there was good knowledge of cesarean section. Despite that, only 6.1% were willing to accept it as a method of delivery while 81% will only accept the procedure if needed to save the lives of the mother and that of the baby. Ashimi et al. in their study on knowledge and attitude of pregnant women to cesarean section at Birnin Kudu, North-Western Nigeria also revealed poor knowledge of cesarean section among 59.1% of the respondents. Despite these studies on cesarean section, the rising trends in cesarian section rates, and the interwoven relationship of anesthesia with the procedure, no study on knowledge, attitudes, and perception toward anesthesia for cesarean section was carried out in our region, especially among pregnant women. This study is aimed at filling the knowledge gap by exploring the knowledge, attitude, and perception of pregnant women toward anesthesia for cesarean section in our center. This was a cross-sectional study among consenting pregnant women at Aminu Kano Teaching Hospital. Ethical approval (AKTH/MAC/SUB/12A/P-3/VII/1839 was obtained on 1st August 2016 from the Hospital Ethics Committee. All the procedures have been carried out as per the guidelines given in Declaration of Helsinski 2013. Questionnaire was structured and pretested, comprising close- and open-ended questions. Administration of the questionnaire was by a trained research assistant on the consecutive pregnant women attending antenatal care at the antenatal clinic of Aminu Kano Teaching Hospital until the estimated sample size number was attained. An informed consent was obtained from the participants before recruitment. Patients were recruited based on their willingness to participate in the study. Pregnant women below the age of 18 were excluded from the study (difficulty obtaining assent). Data obtained was analyzed using the Statistical Packages for Social Sciences (SPSS) version 18 (SPSS Inc., Chicago, Illinois, 2012, US). Qualitative data were summarized using frequencies and percentages. Fischer's exact test was used for categorical data and P ≤ 0.05 was considered statistically significant. The study was carried out from July 1 to September 30, 2016. Three hundred and thirty-seven pregnant women participated in the survey. The mean age ± standard deviation (SD) was 28.71 ± 5.635 years. The age ranged from 18 to 46 years. The median and modal age were 29.0 and 30.0 years, respectively. Up to 101 (30.0%) respondents were within the age group of 25–29 years, while those of age group 30–34 and 18–24 years constituted 99 (29.4%) and 80 (23.7%), respectively. The least age group represented was 45–49 years 1 (0.3%) [Table 1]. The mean parity ± SD was 2.34 ± 2.158 years. 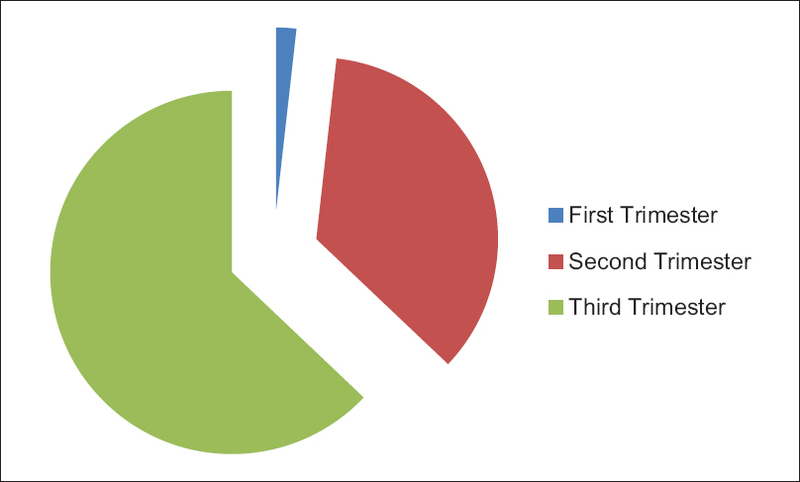 Up to 212 (62.9%) of the pregnant women were in the third trimester of pregnancy; those in the first and second trimester were 6 (1.8%) and 119 (35.3%), respectively [Figure 1]. Two hundred and thirty-two (68.8%) had knowledge of anesthesia for surgical procedures, and in up to 221 (65.5%), the anesthesia known to them was for cesarean section. Regional anesthesia was more popular 114 (51.6%) among the respondents than general anesthesia 107 (48.4%) [Table 2]. 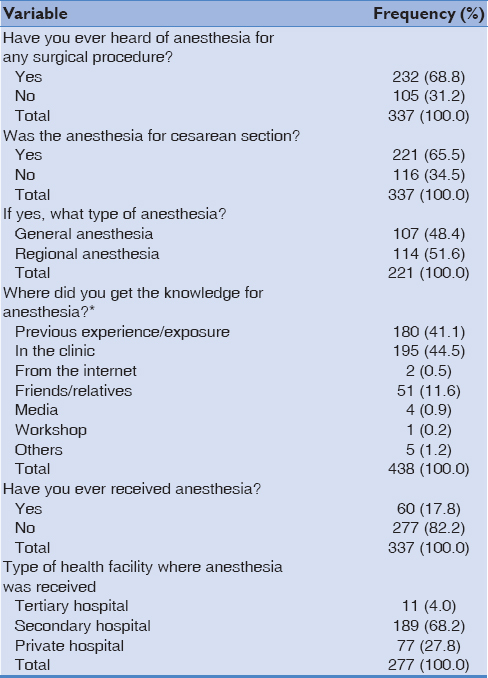 Main sources of knowledge for anesthesia were information from the clinic 195 (44.5%) followed by knowledge from previous experience/exposure 180 (41.1%) and information from friends/relatives 51 (11.6%). Only 60 (17.8%) pregnant women had received anesthesia in the past, and majority of them received the anesthesia at secondary hospital (189, 68.2%). The anesthesia received was eventful among 35 (58.3%) pregnant women. Those events comprised mainly headache (24, 64.9%) and delayed recovery (11, 29.7%) [Table 3]. Preference of anesthesia for cesarean section among the pregnant women was regional anesthesia (246, 73.0%) followed by general anesthesia (91, 27.0%). Main reasons for their preference include safety (258, 44.3%), fear of death (240, 41.2%), and the desire for being awake during the procedure (85,14.5%). 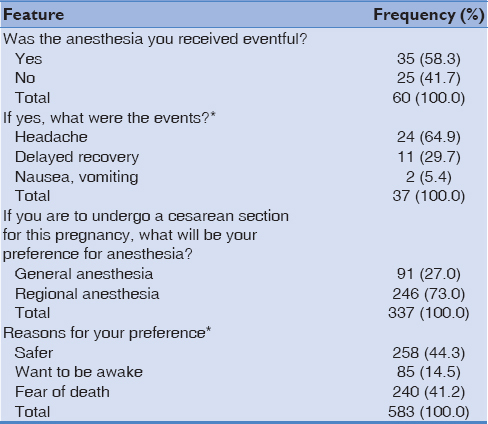 Up to 113 (33.5%) strongly preferred their opinion toward the type of anesthesia they chose for cesarean section, 214 (63.5%) preferred their opinion and 10 (3.0%) had no idea about their opinion. Knowledge of anesthesia was statistically associated with the age groups of the respondents (P = 0.027) where the age group of 30–34 years had the highest knowledge (21.4%), followed by 25–29 (19.3%) and 35–39 years (11.3%). However, there was no linear relationship. Similarly, knowledge of anesthesia was also found to have an association with their occupation (P = 0.003). Home managers were found to have the highest knowledge (44.8%), followed by professional/executives (17.8%) and students (3.9%). However, educational status was not associated with knowledge of anesthesia (P = 0.556). In this study, awareness of anesthesia for surgical procedure was 68.8% and for cesarean section alone was 65.5%. This was higher than the figure of 31.3% reported by Jemal et al. in Ethiopia among pregnant mothers on perception, knowledge, and attitude about anesthesia for cesarean section but lower than the figure of 82.4% reported by Ahmad and Afshan in Pakistan. This might not be unconnected to the level of education of pregnant women in this study. Regional anesthesia (spinal) was also slightly preferred than general anesthesia in this study (51.6% vs. 48.4%), but the difference was unremarkable. The practice of general anesthesia in secondary hospital and changing trend toward spinal anesthesia for cesarean section in most tertiary hospital could be responsible for this balanced near equaled figure. 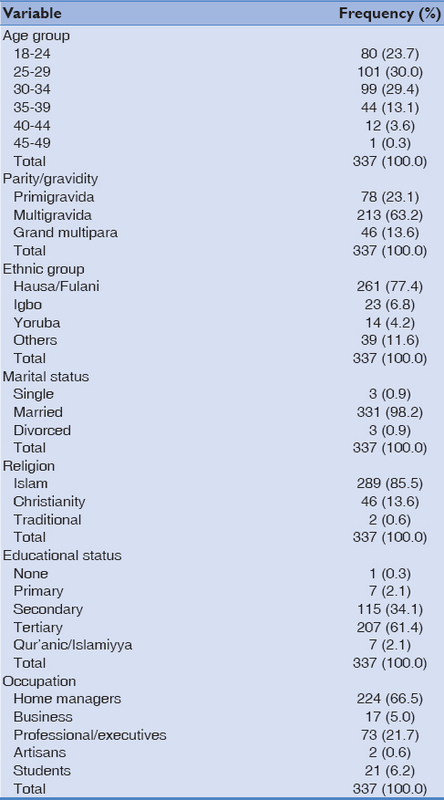 In Eastern Nigeria, Okafor et al. reported a yearly increase in the use of regional anesthesia from 18% in 2003 to 48% in 2004 and 72.6% in 2005. Main sources of knowledge for anesthesia were from the clinic 44.5%, previous experience/exposure 41.1%, and from friends/relatives 11.6%. Jemal et al. reported previous exposure and information from anesthetists or nurses as the two main sources of anesthesia knowledge. Our findings are not different. Few pregnant women (17.8%) received anesthesia in the past and were given at secondary hospital (68.2%) which was eventful (58.3%). This is not contrary to other studies, where anesthetic events were reported. Here, the anesthetic events reported consisted mainly of headache (64.9%) and delayed recovery (29.7%). Tsenov reported 22%–36% of pregnant women with complaints of headache following spinal anesthesia. Our finding was higher. Limited number of expertise and modern equipment in our center could be attributable to the higher figure. Delayed recovery was also reported by Jemal et al. in up to 12.2% of the patients. Our respondents preferred regional anesthesia (73.0%) over general anesthesia (27.0%). This is in accordance with current teaching as reported by several researchers.,, Safety (44.3%) and fear of death (41.2%) were reported as their main reasons for their preference. This is contrary to the findings of Jemal et al. where mothers reported the need to see their babies (12.6%) and to be awake (6.54%) during the operation as their main reasons. The main source of knowledge of anesthesia (clinic: 44.5%) in this study played a pivotal role toward their opinions. The study also showed statistically significant association between the knowledge of anesthesia and their age group (P = 0.027) or occupation (P = 0.003) but no association with educational status. Our study is limited by lack of post intervention phase. This would have enabled comparison base line knowledge and practice. The study revealed high knowledge and awareness of anesthesia for cesarean section among pregnant women and regional anesthesia was preferred over general anesthesia. There is a need to improve on the equipment and skills of the anesthetists to reduce the complaints of postdural puncture headache and delayed recovery associated with regional and general anaesthesia respectively. This is a questionnaire-based study. Simple Definition of Anaesthesia. Merriam-Webster Dictionary. Available from: http://www.meriam-webster.com/dictionary/anaesthesia. [Last accessed on 2016 Apr 20]. Anaesthesia, General: Encyclopedia of Surgery. Available from: http://www.surgeryencyclopedia.com/A-Ce/Anaesthesia-General.html. [Last accessed on 2016 Apr 20]. Morby's Medical Dictionary. 8th ed. Copyright 2009. Available from: http://medical-dictionary.thefreedictionary.com/local+anesthesia. [Last accessed on 2017 Sep 13]. Hawkins JL, Koonin LM, Palmer SK, Gibbs CP. Anesthesia-related deaths during obstetric delivery in the United States, 1979-1990. Anesthesiology 1997;86:277-84.
WHO Statement on Caesarean Section; 2015. Available on: http://apps.who.int/iris/bitstream/10665/161442/1/WHO_RHR_15.02_eng.pdf?ua=1. [Last accessed on 2017 Sep 13]. Ibekwe PC. Rising trends in caesarean section rates: An issue of major concern in Nigeria. Niger J Med 2004;13:180-1. Aziken M, Omo-Aghoja L, Okonofua F. Perceptions and attitudes of pregnant women towards caesarean section in urban Nigeria. Acta Obstet Gynecol Scand 2007;86:42-7. Ashimi A, Amole T, Aliyu L. Knowledge and attitude of pregnant women to caesarean section in a semi-urban community in Northwest Nigeria. J West Afr Coll Surg 2013;3:46-61. Jemal B, Tesfaye M, Alemu M. Perception, knowledge and attitude of developing country pregnant mothers about anaesthesia for Caesarean section. Univ J Med Sci 2006;4:31-7. Ahmad I, Afshan G. Knowledge and attitudes of Pakistani women towards anaesthesia techniques for caesarean section. J Pak Med Assoc 2011;61:359-62. Available from: http://jpma.org.pk/full_article_text.php?article_id=2701. [Last accessed on 2017 Sep 13]. Okafor UV, Ezegwui HU, Ekwazi K. Trends of different forms of anaesthesia for caesarean section in South-eastern Nigeria. J Obstet Gynaecol 2009;29:392-5. Rukewe A, Fatiregun A, Adebayo K. Anaesthesia for caesarean deliveries and maternal complications in a Nigerian teaching hospital. Afr J Med Med Sci 2014;43:5-10. Adekola OO, Desalu I, Adekunle MO, Asiyanbi GK, Irurhe NK. Complications and outcomes following central neuraxial anaesthesia in a Sub-Saharan Tertiary Hospital: The legal implications. Egypt J Anaesth 2015;31:189-95. Tsenov D. An alternative method for treating headache after spinal anesthesia in cesarean section. Akush Ginekol (Sofiia) 1996;35:6-7. Cyna AM, Dodd J. Clinical update: Obstetric anaesthesia. Lancet 2007;370:640-2. Algert CS, Bowen JR, Giles WB, Knoblanche GE, Lain SJ, Roberts CL. Regional block versus general anaesthesia for caesarean section and neonatal outcomes: A population-based study. BMC Med 2009;7:20.